Today is hot, there is no other word for it. I had a bizarre back and forth email communication with someone recently who found the heat at this time of year to be so miserable that it ruined his holiday, with 7-11 with their arctic aircon the only refuge. Today would be one of those days. I mean, it's hot here year round, but right now there's hardly any wind and during the middle of the day, and I will say it again, it's HOT here in Phuket. From midday to 3pm a siesta is advised! There is rain too, with isolated thunderstorms in the afternoon and evening. 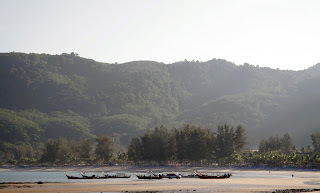 I will emphasize the "isolated" aspect of the rain - on Monday (30th March), I had a Skype chat with my wife as follows.. She was at home near Phuket Town, I was at Karon Beach. [3/30/2009 6:08:18 PM] Sunrise Divers says: oh dear! [3/30/2009 6:08:19 PM] Jamie Monk says: no not really hard but very windy. [3/30/2009 6:08:37 PM] Jamie Monk says: blow everything away. As the crow flies, it's 10km from my house to Karon Beach, but the weather was totally different. The last couple of nights have been the same - some localised hard rain, then clear skies and sunny mornings. As I write, our sunny day in Karon Beach looks like it's over... will rain again soon. Best thing is to get up early. Yesterday I was out of the house by 7:30 and walking on Kamala Beach before 8am. I don't go to Kamala that often, but yesterday enjoyed the walk. The beach is about a mile long and it's so much quieter than the other "main beaches". 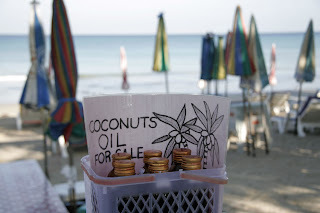 More about the beach on my Phuket blog : Kamala Beach.